This is my favourite pizza ever. I was first introduced to the concept of tom yum pizza when I was a teen by none other than Pizza Hut Thailand! They put “tom yum goong pizza” on the menu and I loved it! I loved the bold, bright flavours of lime and lemongrass on an otherwise rich and cheesy pizza. I’m using classic Tom Yum toppings here: shrimp and oyster mushrooms, through straw mushrooms would be more traditional but I can’t get those here. You can change the shrimp to chicken (make sure the chicken is precooked), or add calamari (which is what a big pizza restaurant chain does in Thailand), or keep it meat free and load up on a couple of types of mushrooms. Hey it’s pizza, top it with whatever you want! I love using fresh mozzarella cheese on pizza, but the regular block type that you need to grate would be fine. The sauce recipe uses up one whole can of tomatoes, but it’ll make more than you need if you’re only making 2-3 pizzas. You can make about 6-8 10-inch pizzas with this amount of sauce. You can make only half the sauce recipe if you don’t want to have much leftover, however, the sauce freezes really well so you can keep it and have it for future pizza cravings! It’ll also last about a week in the fridge. You can also thin out the sauce a bit and use it as a pasta sauce as well. The coolest part of this recipe might be the way the pizza is cooked. I use a broiler-skillet method which I got from Serious Eats and I think it’s brilliant. Saves so much time and yields better results than baking in the oven. I love that I only need to preheat the broiler, which takes only a few minutes, as opposed to preheating the whole oven to 450°F or 500°F which would take nearly an hour. No pizza stone needed, and the bottom crust still gets a nice crisp, slightly charred bottom. And it’s done cooking in 5 minutes! When I put my pizza on the highest rack, it is 3 inches away from the element. On your oven, the “highest rack” may put your pizza closer to the element, so if it seems precariously close, use the second highest rack instead and it may just take another minute to cook. Your baking sheet will warp under the heat; mine does too, but it should return back to its original shape once it comes out of the broiler (you can see in the video that the baking sheet comes out flat, but it did buckle in the oven). To minimize pan warping, use thicker, sturdier baking sheet rather than thinner ones. Because the broiler is extremely hot, don’t put any liner on the baking sheet (no parchment paper, no silicone mat, etc.). And don’t use a non-stick, teflon-coated baking sheet which are not meant to be placed under high heat. Please see broiler safety notes above before making! Note: Shrimp cook very quickly so you can use them raw, but it’s also okay to start with cooked shrimp. If using other kinds of protein, such as chicken, pre-cook it first so you don’t have to worry about whether they’re cooked on the pizza. Tools: If using my cooking method, you will need a 12-inch flat skillet that can withstand high heat. If you only have a 10-inch skillet, make the pizza a bit smaller so it’ll fit into your skillet. In a large mixing bowl, whisk together flour, salt, and sugar until combined, then whisk in yeast. Make a well in the centre and add water and olive oil. Use your hands to gradually incorporate flour into water and knead until moisture is evenly distributed throughout the dough; the dough will look a little rough and not smooth, but that is okay. Cut dough into 2 equal portions. Place each one in a well-oiled bowl or container large enough to contain double the volume of the dough. Flip dough and move it around so it is coated in oil. Cover and let dough rise in the fridge for at least 1 day and up to 3 days. If in a rush, you can let it rise at room temp for 1 ½ – 2 hours and bake it right away, but the flavour will not be as good this way. Bring out dough 2 hours from fridge before shaping and baking. In a medium pot, add olive oil and garlic and cook over low heat for about 3 minutes so garlic is gently bubbling, and smallest bits start to turn golden. Meanwhile, blitz tomatoes in a blender for a few seconds just until there are no more big pieces—you don’t want a smooth puree here. Add blended tomatoes, Thai chili paste, and 2 Tbsp of fish sauce into garlic pot; stir to mix. Simmer gently for about 1 hour, stirring occasionally, until tomato sauce is thick and luscious. Meanwhile, in a mortar and pestle, pound lemongrass until fine. Then add galangal, kaffir lime leaves, and Thai chilies and pound until there are no more big pieces of galangal left (lime leaves won’t break down completely, that’s okay). Alternatively, process herbs in a coffee/spice grinder until fine. Once sauce is done simmering, add herb mixture and simmer for another 3-5 minutes (it should look a bit too thick right now). Turn off heat and stir in 3 Tbsp of lime juice, which should thin it out to the right consistency. Taste and adjust seasoning with remaining fish sauce and lime juice as needed. The sauce should have a bold tom yum flavour that leads with tartness, balanced by sweetness from chili paste. Bring dough out from fridge 2 hours before baking so it comes to room temp. Get your toppings ready; toss mushrooms in a bit of oil to prevent them from drying out in the oven. Preheat broiler to high while you shape the pizza, and set rack to its highest position. Note: When I put my pizza on the highest rack, it is 3 inches away from the element. If your highest rack puts your pizza closer than that, see safely notes above. On a baking sheet that can be used under the broiler (so no non-stick sheets), sprinkle a generous amount of flour on it. Note: Do not line the sheet with any parchment, silicone mat, or anything else. Place one piece of dough on baking sheet and press it down into a flat disk with your fingers. Generously flour the top of dough, then flip it upside down. Then stretch or roll pizza out to 10 inches. You can stretch it upto 12 inches if you like really thin crust, but make sure it will still fit in the skillet if you’re using my method of cooking. As you stretch dough, keep moving it to check that it slides freely; if not, add extra flour to the bottom to ensure that it will not stick. Spread sauce onto dough (you’ll need about 1/4 cup). Then top with shallots, shrimp, cheese and mushrooms. Broil the top of pizza for 2 – 2 1/2 minutes or until the crust is well browned. Watch the pizza in the first minute and rotate the pan if browning is uneven. Baking sheet will buckle a bit under high heat, this is okay, as long as the pizza is not touching the element. While pizza is broiling, preheat a dry 12-inch skillet on the stove over high heat. 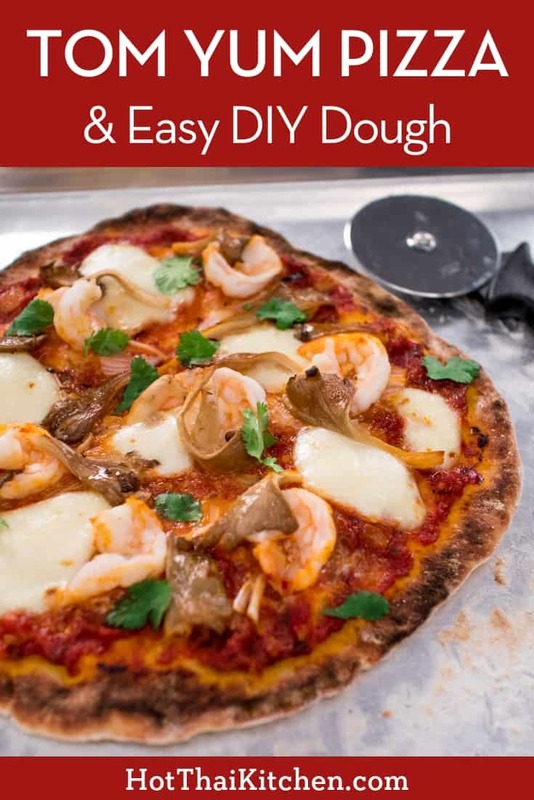 Once pizza edges are puffed and browned, remove from broiler and use a spatula to quickly slide pizza onto preheated skillet to cook the bottom for another 2 minutes, or until bottom is well browned. Slide pizza onto a serving plate and sprinkle with chopped cilantro. Serve immediately!